John Liautaud's recipe for a good food franchise: fresh ingredients, fast delivery and an irreverent sense of humor. At 19, he started Jimmy John's gourmet sandwich shop with used equipment. His monthly rent at the time was just $200 a month. To drum up business, Liautaud gave out sandwiches for free. That was 1983. 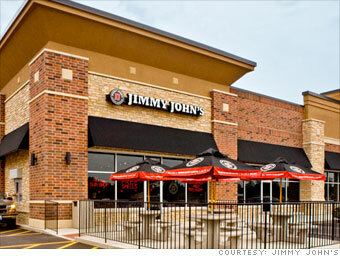 Today, there are more than 1,000 Jimmy John's shops. Franchisees took out 122 SBA-backed loans between 2005 and 2010, and only two loans failed. The company estimates that annual sales can reach $1.2 million and net profits average about $280,000. The startup costs -- not including real estate -- are between $305,500 and $485,500. Franchisees also need $80,000 in cash and a net worth of about $300,000. Source: Loan data is from the Small Business Administration, covering loans made from October 2005 through September 2010. Only those franchises for which the SBA backed 70 or more loans were included. A loan was counted as "failed" if the franchisor stopped repaying the loan and the SBA had to purchase -- or take over -- the loan.